LONE GROVE, Oklahoma (CNN) -- A scene of devastation emerged Wednesday as circling helicopters broadcast images of housing developments smashed by tornadoes and severe storms that killed at least eight people in south-central Oklahoma Tuesday. 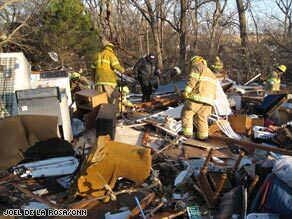 Rescue personnel search for potential trapped victims Wednesday in Lone Grove, Oklahoma. Storms ripped roofs off several homes and left twisted metal and other debris scattered across the area. Firefighters and emergency personnel were working with distressed residents. "It was just, like, one after another. As soon as you get calmed down there were more," he said. The storms had moved out of the state Wednesday morning after at least three tornadoes touched down in central and southern Oklahoma Tuesday, the National Weather Service said Wednesday. The one that hit Lone Grove at about 7:30 p.m. had an intensity of EF4 and winds of around 170 mph. The Enhanced Fujita scale measures the intensity of a tornado and its wind speeds based on the type of damage caused and rates it between EF0 and EF5. The first tornado, which hit Edmond between 2:30 p.m. and 3 p.m., had an intensity ranging between EF0 and EF2, the NWS said. The service has not been able to determine an intensity for another tornado that hit near Langston about an hour later. "We're just trying to get stuff in people's hands," store owner Matt Wilson told CNN while handing out pry bars and flashlights to residents at his hardware store in Lone Grove, where heavy damage occurred. "But just about all of Lone Grove is without power." Also hit hard by the storms were the towns of Pawnee and Edmond, both north of the capital. "The wind started blowing really hard and then died down," a Lone Grove man told CNN affiliate KOCO-TV. Then, "all heck broke loose. I mean, it just broke loose. The whole house shook." Mercy Memorial Health Center in Ardmore, about eight miles east of Lone Grove, received 46 people with injuries -- seven considered major -- after the storms passed, said Shana Hammond, a hospital spokeswoman. About 6,000 OG&E customers are without power, including nearly 3,500 in Lone Grove, according to a statement released by the Oklahoma Department of Emergency Management on Wednesday. CNN's Robyn Sidersky contributed to this report.